The monastery of Dionysus, dedicated to St. John the Baptist, is built on a narrow strip of craggy rock and adjoins to dizzying cliffs. 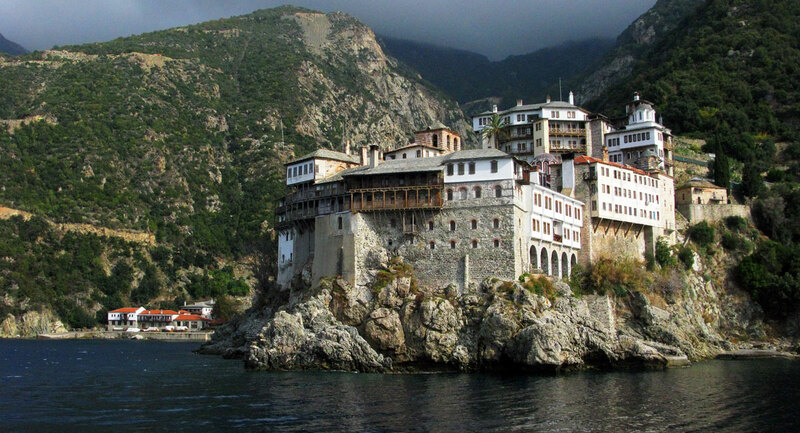 Balconies of the cells of the monastery hang over the stretching sea. 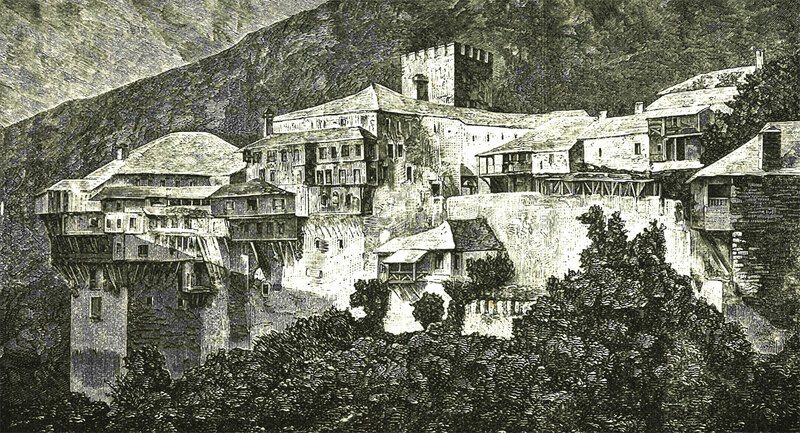 The monastery was founded in 1370 by Saint Dionysius of Kastoria, helped by the construction of the Emperor Alexius III Comnenus, to which the brother of St. Dionysios, Metropolitan Theodosius of Trapezund, turned for help. In connection with this blessing, Dionysus was often called “the monastery of the great Comnenus.” Soon the monastery was attacked by pirates who captured most of the monks and held them until the Emperor and Saint Dionysius collected money for ransom. The cathedral church of the monastery is decorated with amazing frescoes by the famous Greek painter Tzorzis, master of the Cretan school. The outer walls of the refectory are covered with a unique prophetic painting. Created in the XVII century, these frescoes depict pictures of modern war, including atomic bombs, fighter planes and flamers. There are also images of a “cosmic ray” with which, thank God, mankind is not familiar yet. The monastery owns 14 small churches and chapels, seven cells and a farm. Of particular interest is the chapel of the Theotokos Akathistos, located in the porch of the cathedral. In the Chapel of Praise is a miraculous icon of the Virgin “Praising”, modeled from wax and mastic. It eminate mirhogenerously. 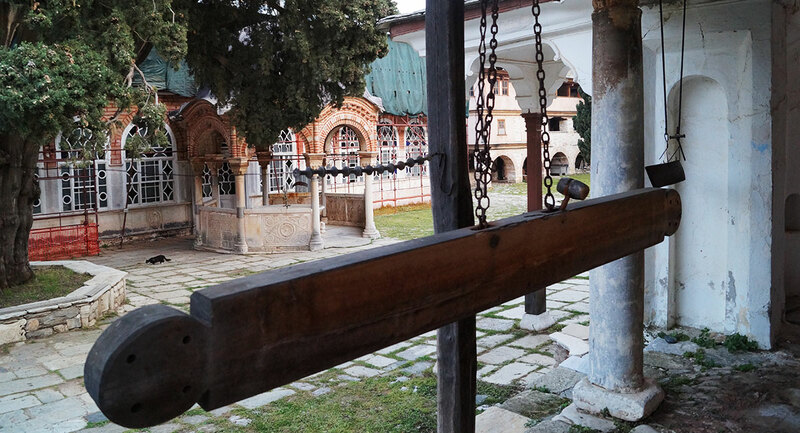 Tradition says that before her, Patriarch Sergios, the creator of the anthem in honor of the Mother of God, sang it after his victory over the Scythians. Patriarch Sergius held the icon around the walls of Constantinople during the siege of the city by the troops of the barbarian and Slavs in 626. In 1592, the icon was stolen by pirates, but their leader, fearful of something that he saw in a dream, decided to return the icon to the monastery. Pirates, having opened a box with icon, felt that an unearthly fragrance emanates from it. It made such a strong impression on them that they not only returned the icon, but also became monks. Among the shrines of the monastery are the right hand of St. John the Baptist and St. John Elekmon, the wrist of the right hand of St. Luke the Evangelist, St. Nifont, Patriarch of Constantinople, who patriarchal two terms and died in this monastery, the wrist of St. Panteleimon’s right hand, the right hand of PriestMartyr Vlasy, bishop of Sevastia, bones of the saints of Kosmos and Damian, and many other Saints. Saint Nifont was a talented and educated man. On the Holy Mountain in the monastery of Dionysus he accepted the priesthood. In 1486 he was forced to agree to become an archbishop and was elected Patriarch of Constantinople. The Patriarch, answering directly before the Sultan, balanced between the need, on the one hand, to preserve and maintain Greek culture, life and Orthodoxy itself, and on the other hand, to oblige the Turks. He is venerated as a man, thanks to which Orthodoxy has been preserved in Romania. After many years spent far from the Holy Mountain, Saint Niphont returned to Dionysus and, without naming himself, asked to be accepted in the brethren. As a novitiate he was put in the afternoon to take care of the monastic cattle, and at night watch in the tower at the top of a high cliff to warn about the approach of pirates. A few weeks later it was discovered that at night, when Nifont was there, a fiery pillar shone. The saint realized that his secret was revealed and tried to escape, but the brothers held him, begging him not to leave them. A year later he gone to the Lord. His relics are in the monastery of Dionysat, and only the head and right hand – in the Romanian monastery. 55 monks living in the monastery.